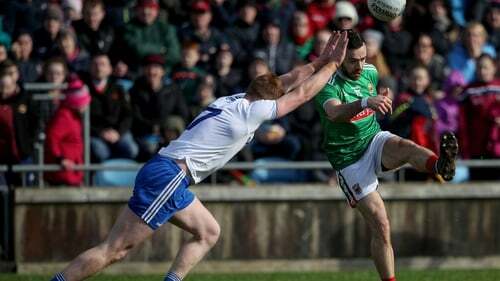 Three goals proved crucial in the end as Mayo qualified for their first Allianz League Division 1 final in seven years by virtue of this action-packed win over 14-man Monaghan at MacHale Park, Castlebar. Kevin McLoughlin hit the net twice in the opening half to put the homeside in the driving seat, and their third goal arrived after Monaghan defender Ryan Wylie deflected the ball into his own net in the 50th minute. The visitors staged a brave comeback in the final quarter — with Conor McManus leading the charge — but a red card for Fintan Kelly just six minutes after the restart had left the Farneymen short of manpower. And despite their best efforts, and a stunning goal from Darren Hughes, Monaghan had to be content with the fact that they would still be safe in the top-flight again next year following Kerry’s win over Roscommon elsewhere. However, Mayo’s fifth victory of the campaign, allied to Tyrone’s win over Galway, means that James Horan’s team will meet now take on Kerry next weekend at Croke Park. The Westerners played some scintillating football to win their third home game out of four this spring. All but four points of their final tally came from open play, and they never really looked like slipping up in front of a huge crowd of 13,287 people. Despite playing against the gale-force wind in the opening half, Mayo led at the interval by 2-7 to 0-6. The diminuitive half-forward clipped three superb points from play, with Jason Doherty (free), James McCormack, Aidan O’Shea and Brian Reape (mark) also on target. Down at the other end, Monaghan had to rely on the enigmatic Jack McCarron to keep them in touch. The Currin sharpshooter landed five points, all from play, in the first period while Monaghan’s only other scorer before the break was Conor McManus. Flying wing-back Karl O’Connell also had a goal chance well saved by Mayo goalkeeper David Clarke in the early stages. Clarke’s afternoon was ended early after a collision with Darren Hughes, and the two-time All Star winner was replaced by Rob Hennelly before the interval. It was the only negative to an otherwise excellent first half display by Mayo as they established a significant advantage. Monaghan’s hopes of mounting a comeback suffered an early setback when Fintan Kelly was sent off after referee Derek O’Mahony adjudged his challenge on Kevin McLoughlun to have been too robust. Buoyed by their third goal, James Horan’s side tagged on points from Brendan Harrison, Jason Doherty and McLoughlin to lead by eight points at the end of the third quarter. unanswered points, four from Conor McManus frees, meant that the game ended in a welter of excitement. By the 60th minute, Mayo’s lead had been pared back to just two points but the homeside steadied the ship with two scores from Diarmuid O’Connor and Donal Vaughan to seal a deserved win. Monaghan: R Beggan (0-1, 1f); B Kerr, D Wylie, R Wylie (1-0, OG; K O’Connell, C Boyle, K Duffy; D Hughes (1-0), N McAdam; R McAnespie (0-1), D Malone, F Kelly; C McCarthy (0-1), J McCarron (0-7, 1f), C McManus (0-8, 5fs). Subs:S O’Hanlon for Malone; D Mone for McAdam (49); V Corey for D Wylie (55); O Duffy for McCarthy (71).